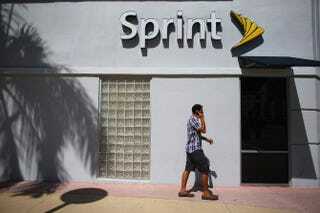 A Sprint Nextel cellphone store is seen on Oct. 15, 2012, in Miami. It's not quite clear what exactly Sprint was trying to accomplish with its ill-fated, rather tasteless ad, but a few hours of Twitter outrage took care of the controversial video: It was pulled Tuesday night, the Washington Post reports. The carrier has, of course, been duking it out with other telecommunications companies, namely AT&T, Verizon and T-Mobile. In its latest bid to outdo its competition, Sprint thought it was a great idea to air footage of a customer calling T-Mobile "ghetto." In the ad, Sprint CEO Marcelo Claure asks a customer what she thinks of T-Mobile. "I'm going to tell you a carrier name, and I want you to basically tell me what comes to your mind," Claure says in the video. "T-Mobile. When I say T-Mobile to you, just a couple of words?" "Oh, my God, the first word that came to my mind was … 'ghetto'!" the customer, a white woman, replies with a bit of a dramatic pause, to laughter and nods in the room. “That sounds, like, terrible. I don't know. "People who have T-Mobile are just, like, why do you have T-Mobile?" she continues. On Tuesday at about 1 p.m. Eastern Daylight Time, Claure tweeted the video, tagging T-Mobile and adding in the caption, "Sometimes the truth hurts." "We're sharing real comments from real customers. Maybe not the best choice of words by the customer. Not meant to offend anyone," he added in a follow-up tweet. Twitter users, however, were not having it. Claure was almost immediately hit with the backlash, with users calling the ad "stupid," "racist" and "classist." After eight hours, Claure announced that he would be pulling the video and apologized.